George Napier kicks things off by describing the task at hand, as well as the backgrounds of the collaborators. “Robert, Roger, and I took a group of 11 executives from a 75-person tech startup into Studio A of Omega Studios for two days of team building. We needed to prepare backing tracks and beds for them to play against. Roger is a film composer, former Logic guy and current Mac-based Cubase user. Robert is a musician and games music composer and a 20 year die hard Digital Performer user who switched to Windows on DP and was not liking the experience,” says George. “I’m a composer/sound designer and a bit of a serial monogamist when it comes to DAWs. I’ve used Studio One since version 1, left it for Logic/Cubase at 2.6, and came back to try it out with the release of 3 (all on Mac). FYI: We all work together on projects for each other’s companies. This particular project was done under Robert’s company ResonantClarity. Napier has been with Studio One from the get-go. “I think I had been using Digital Performer for a while when I tried out a demo of Studio One in early 2010. I fell in love with the drag and drop workflow and I couldn’t believe how efficient of a VI host it was and that I could use AUs and VSTs! I used it quite exclusively over the first few years but later switched to Cubase and Logic around version 2.6. But when Studio One 3 was announced, I was blown away. I remember watching the announcement live on the web and repeatedly picking my jaw up from my desk. I immediately bought it and started working with it again, and have ever since. Napier is quick to describe why he came home to Studio One. 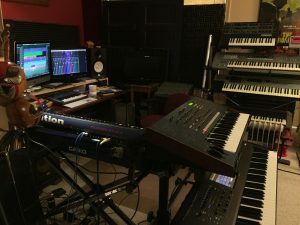 Roger Hooper is a longtime Cubase and Logic user who was new to Studio One for this collaboration. His impressions and description of the collaborative workflow follow. 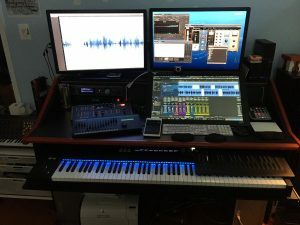 Hooper found himself impressed with Studio One’s flexibility, particularly in regards to the easy mobility between Studio One’s Song and Project pages. When prompted for user tips and tricks for Studio One, Hooper acknowledges that he’s new to the software, but found the most valuable resource to be Studio One’s robust online community. Asking Robert what he likes about Studio One begets a long response. Holmes even had a happy accident concerning Studio One’s Console Shaper. “I had one interesting experience where I was mixing, and I was getting lots of crosstalk,” recalls Holmes. “And it was actually very cool from a sonic point of view, but it was making mixing a challenge. That’s when I discovered the Console Shaper had accidentally been activated on the master track somehow and was in Crosstalk mode. 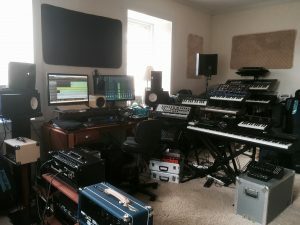 So YES, the crosstalk really works if you want that Gold Star Studio Wall of Sound.”Despite a lengthy relationship with Digital Performer, Holmes has taken the plunge and made the switch to Studio One as a result of his experiences in this project. “I had been a longtime Digital Performer guy, basically for the last 20 years. My pal George sent me the Studio One demo and suggested I give it a spin. As I’m a self-confessed immediacy freak with gear, the ease of entry and short learning ramp was very helpful when I had to make a quick jump from DP in the midst of a project. The similarities in workflow were helpful, yet it all was so much more fluid and responsive.